SNAFU! : Ofek Heavy APC (based on the Merkava 2)...the Namer before the Namer! Ofek Heavy APC (based on the Merkava 2)...the Namer before the Namer! Thanks to Vodknar for the pic! Hat Tip to Vodknar and Military Today. The above pic was posted on open comments and was totally new to me. Come to find out its a Merkava 2 mod. It's the Ofek Heavy APC. 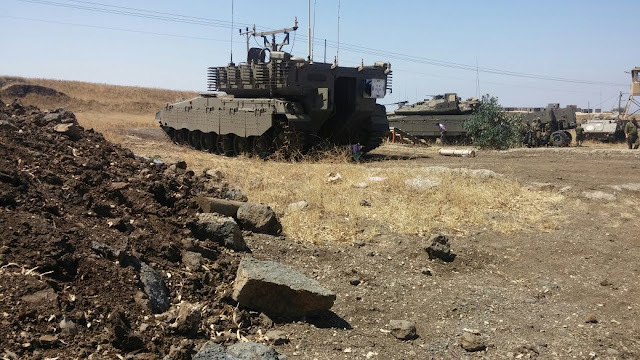 We've seen the Israelis do this with other tanks (especially the Centurion), transforming them into heavy APCs or engineer vehicles and it should have been a no brainer that they would do the same to early Merkavas. The fact that it took me this long to lock onto a vehicle that has been in service with the IDF for a bit is irritating. I thought we (me and my readers) had a good lock on armor development around the world.